She lives in a small apartment. او در آپارتمان کوچکی زندگی می کند. I had never been in the prince’s private apartments before. ▪ a one-bedroom/two-bedroom etc apartment (also one-bedroomed/two-bedroomed apartment British English) A tiny one-bedroom apartment was all she could afford. 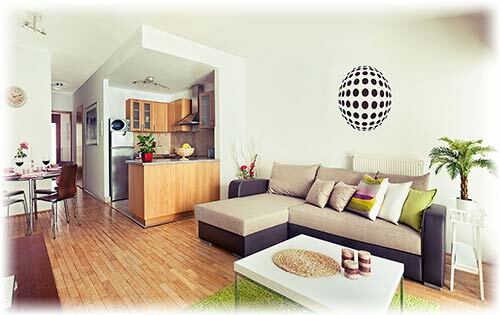 ▪ a studio apartment (=with just one main room, which you use for sleeping, cooking, and eating) Studio apartments can be a good option for those who want a cheap place in a good location. ▪ a first-floor/second-floor etc apartment We had a fourth-floor apartment, and it was difficult going up and down all those stairs. ▪ a penthouse apartment (=on the top floor of a building) She bought a penthouse apartment in Santa Monica. ▪ a luxury apartment The school has been converted into luxury apartments. ▪ a holiday apartment British English, a vacation apartment American English We rented a holiday apartment on Mallorca. ▪ live in an apartment He lived in a small apartment on the third floor. ▪ buy/rent an apartment Tom rented an apartment at the top of the building. ▪ share an apartment I’m sharing the apartment with a group of friends. ▪ own an apartment My parents own an apartment in Madrid. ▪ move into/out of an apartment (=start living in a new apartment, or leave an apartment in order to live somewhere else) They moved into the apartment last Easter. ▪ an apartment building (also an apartment block British English, apartment house American English) a five-storey apartment block | Our apartment building is the last block on the right, opposite the bank. ▪ apartment especially American English, flat British English a set of rooms where someone lives that is part of a house or bigger building. In British English, people usually say flat. Apartment is used about large and expensive flats, or in advertisements: His apartment is on the eighth floor. | In London, I shared a flat with some other students. • You can visit the whole palace except for the private apartments. mid 17th cent. (denoting a private suite of rooms): from French appartement, from Italian appartamento, from appartare ‘to separate’, from a parte ‘apart’. Apartment or flat? The usual word is apartment in American English and flat in British English. If apartment is used in British English it may mean a place that is larger, finer or more expensive than an ordinary flat. have/hold/hand over the deed/(especially BrE) deeds of/to the house, land, etc. • Apartment dwellers can participate in community gardens. • Colin lives in a dingy one-room apartment with his pet turtles. • I share an apartment with two friends. • I'm looking for an apartment on the east side of the city. • Larger cities have many high-rise apartments. • We will be renting the apartment for a year. • Finding an apartment in any city can be a difficult task. • Our self-catering apartments are located just a minute's walk from the beach. I'll give you the keys to my apartment. They have six holiday/luxury apartments for sale. The Royal Apartments are open to the public. ...bleak cities of concrete apartment blocks. • We lived in an apartment for several years before buying a house.